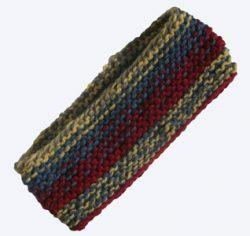 Striped headband, handknit with double strands, in 1940s, 1950s kitchen colors. Light and stretchy. Reversible. Women’s, Teens Medium Size: Circumference of 20 1/2″ stretches to 23″. Width: 3 1/2″. Wool, acrylic, nylon yarns. Hand wash and lay flat to dry.